I've done a complete 180 on sand finish polishes over the last few months and I can't get enough of them at the moment. Yeah a bit late to the party haha! I showed you the lovely package Marte sent me yesterday and I immediately wanted to try out the p2 Sand Style polishes. I couldn't resist trying the gorgeous girly Adorable first! 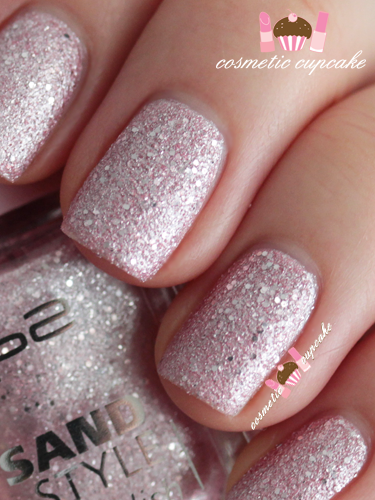 Adorable is a light pink sand finish polish that contains large silver glitters and microglitters. It is super sparkly and my pics just don't do it justice (dodgy lighting oops)!! It's just stunning and I got soooooooo many compliments. I had to bring it in to work and give my workmate a mani using it lol. It applied really well and the brush was great to use. Dry time was quick and man it wears like iron. I took these photos 3 days after application!! There's some slight tip wear on my index and middle fingers which is pretty reasonable. 2 coats is pictured with no topcoat. I love the shade and the finish but I don't have any sand polish yet. I do not know this brand in Spain, so, which other one would you recommend me that I could find more easily? Wow stunning pink, I love P2's sand polishes. They can last up to a ful week of wear, just slight tipwear indeed.